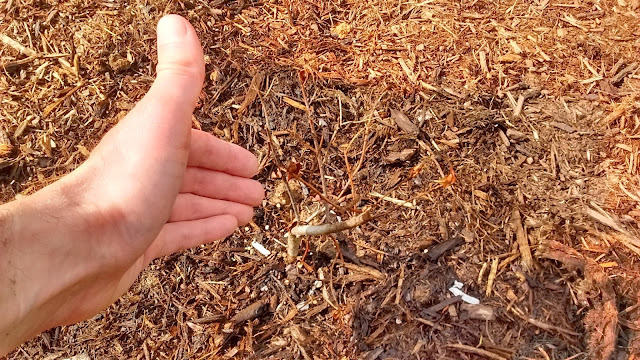 It's hard to see this wax myrtle (Morella cerifera) against the mulch right? That's because this tiny mail order plant never leafed out. Over the years, I've resigned myself to buying a lot of the plants for my garden via mail order. It's simply impossible to find most of the plants - especially natives - that I want at the local nurseries. 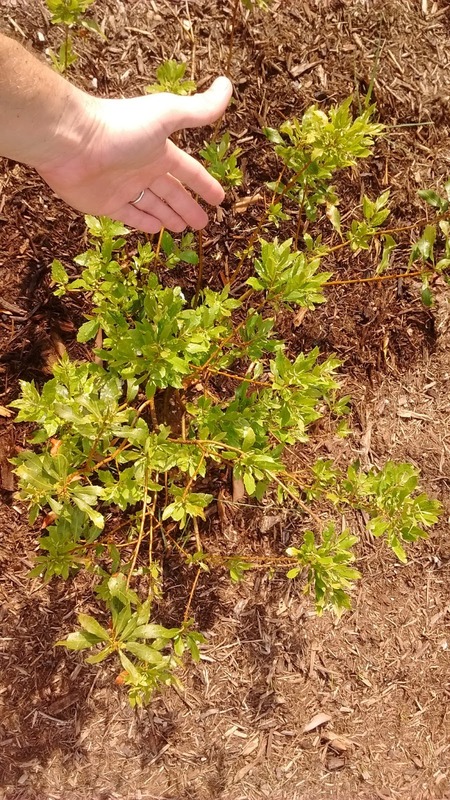 There's one good native plant nursery (GroWild) nearby, but they only offer many (not all) of the shrubs and trees I want in 15-gallon or larger sizes. For a number of reasons, I prefer to install smaller plants (preferably 1-gallon, 2-gallon or 3-gallon, though I sometimes go up to 5-gallon). That means I have to rely on mail order. Don't get me wrong - over the years I've found a few excellent mail order suppliers, plus some more that are good enough (hit or miss, but with good prices) where I'm willing to take my chances. Then sometimes I decide to try a new supplier. I'm not going to name the culprit just in case this was an aberration, but it sure was disappointing when I opened up my order for three 1-gallon wax myrtles (Morella cerifera) and found a bunch of brown sticks. To be fair, there were three perennial strawberry begonia plants (Saxifraga stolonifera) in the same order that were in much better condition. I planted all three, but two of the wax myrtles never leafed out, so I've now shovel-pruned them and replaced them with woody shrubs - a Burkii juniper from GroWild and a Needlepoint holly from another local nursery. The third one did leaf out and is struggling, but wax myrtles are so tough that I'm (fairly) confident it will eventually survive and hopefully prosper in time. 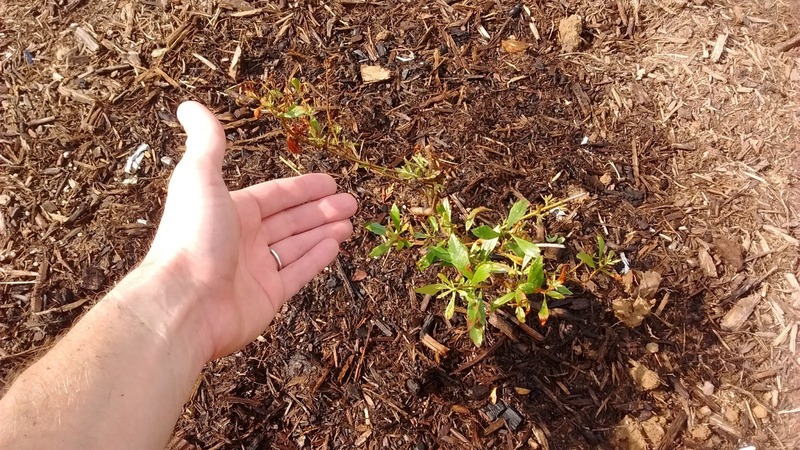 By comparison, I was able to install a 3-gallon wax myrtle that I found down at a Huntsville, Alabama nursery (Bennett Nurseries) that already has a beautiful presence in the garden. Do you use mail order nurseries? If so, which are some of your favorite suppliers? Or are you lucky enough to have great local nurseries either right in your town / metro area or within a short drive? Or do you grow your own plants from seed? I get most of my plants by mail order. Two of my favorites for natives are Reeseville Ridge and Sandy Mush Herb Nursery. Reeseville has mainly native trees and shrubs. They are very young plants at ridiculously cheap prices. In the 3 to 4 dollar range. Sandy Mush has many native perennials and grouncovers at cheaper prices than most I've seen. I do try to grow a lot of natives from seed. Waiting now to see if any will come up. Thanks for the suggestions. Sandy Much in particular looks interesting and I may try ordering some plants from them this autumn.